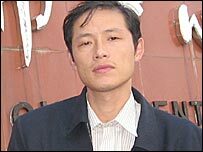 Chinese activist Lu Banglie has been speaking of his beating by unidentified men as he tried to visit a village at the centre of a corruption dispute. Mr Lu had been supporting the villagers of Taishi in their campaign to remove local authorities who are accused of embezzling public funds. He remembers being dragged from a car by a group of around 30 men. His attackers beat him until he was unconscious, and his next memory is waking up in hospital. He is now recovering at his home village in China's Hubei province. Tired and bruised, Mr Lu told the BBC that he had little recollection of the events following his beating on Saturday night. "I feel very weak and my whole body is in pain. I don't know what exactly happened after they beat me because I was unconscious," he said. He had been helping the people of Taishi in a campaign to remove their elected mayor, who is accused of embezzling public money. When he tried to enter the village on Saturday, he was accompanied by a British journalist, who witnessed the beating. China is experimenting with democracy at a local level, but it remains difficult for candidates who are not Communist party members to participate in these elections. With little legal or political recourse, an increasing number of Chinese people are protesting against corruption and growing economic inequality. Mr Lu says he will not take action against his attackers, whom he suspects are connected to the local authority. "I won't take further action to protect my own rights either by means of law or in other ways because it will take too much energy and money. But he says he remains committed to helping the villagers of Taishi in their battle for democracy and greater political freedom. "[The villagers] are in a terrible situation now. Around 20 to 30 villagers are still being detained. Many villagers ran away and they dare not come back," he said.